One of the more recent projects to use Galil's latest generation controllers and amplifiers is the Thirty Meter Telescope. 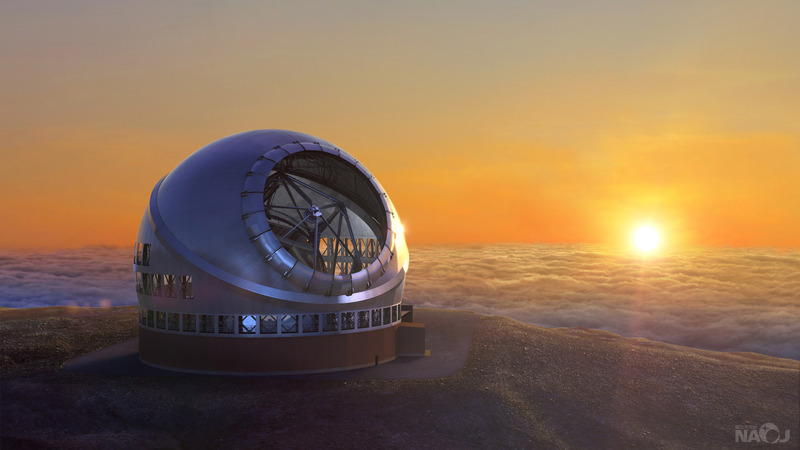 Scheduled to be built near the summit of Maunakea on Hawaii Island, the Thirty Meter Telescope (TMT) will be among the world's largest optical telescopes when its first images are taken towards the end of the next decade. Utilizing an innovative design first used with the Keck I and Keck II Telescopes, the main (primary) mirror of the TMT is composed of 492 hexagonal mirror segments, each nearly 1.5 meters across. These mirror segments are ground and polished to match the overall parabolic shape of the mirror then arranged in a larger superstructure that supports a much smaller secondary mirror and various Instruments. The Thirty Meter Telescope is designed to peer into the deepest reaches of space, but given the nature of Earthbound Astronomy, it will be susceptible to much more terrestrial concerns. Mirror shaping and polishing is an exacting science and mechanical tolerances can be checked to the micron. Despite this, low order aberrations can make it through final polishing of the mirror surface and installation errors can misalign the segments. To counteract these effects, each mirror segment is supported by a system of actuators and strain gauges (21 per segment), known as a Warping Harness. Every few weeks, if necessary, the TMT will be calibrated against a known light source and all 492 segments then readjusted (via 10,332 actuators and sensors). Therefore, it is critical that the components and materials used in the Warping Harness be highly reliable. Any degradation in feedback or actuator effectiveness must be accounted for as well in order to ensure that images taken are consistent throughout the proposed 50 year lifespan of the Telescope. Figure 2: Fred Kamphues and his team make adjustments to the warping harness and test fixture. These requirements were handily met by the Galil DMC-4080 Motion controller combined with Galil internal D4040 Stepper Drives. The eight, 16 bit analog inputs on each controller take in the strain gauge readings and position the actuators accordingly. A custom GUI sitting on top of a custom built, python based API handles communication and coordination of the tests. Finally, the compact footprint of the controller and integrated amplifiers easily met the portability requirement. Once built, the test system was put through an exhaustive series of accelerated life tests. The DMC-4080 and API combination allowed the flexibility necessary to test multiple prototype harnesses for reliability and function, rapidly adapting to new designs and materials. Typical tests would include cycling actuators and strain gauges through hundreds of thousands of mechanical cycles in temperature and humidity chambers. As design constraints change, new components are run through multiple functional tests. The ease of use and programming of the Galil controller lent itself to rapid development of test scripts and data collection during these tests. With the help of Galil hardware, software and applications support, Fred and his team provided the data and analysis required for the final design review of the Warping Harness, which was recently completed in July, 2018. Additional testing will no doubt continue well into the next decade as Galil continues to play a key role in Scientific discovery.